Ultra-high quality compact chorus pedal for guitarists and keyboardists. BOSS 5-year warranty! High- and Low-cut filters for shaping tonality of the chorus. Offers Effect Level, Rate, Depth and Filter knobs for complete control. Mono input and Stereo outputs for connection to dual amps or for studio use. 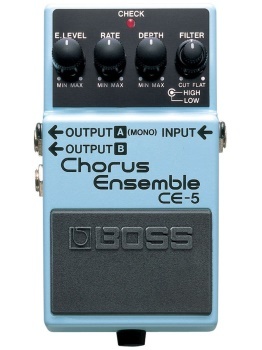 Produces a range of chorusing effects, from subtle to extreme.